Suppose you were walking in the mall, minding your own business when suddenly you hear screams as you see children trying to have their picture taken with a pony with a cowboy hat, horsing around in the aisle? Possibly you’ve also noticed kids clutching pastel pony toys in their arms, a free toy from a meal? Maybe you’ve stumbled upon several hilarious memes with a unicorn theme online? Perhaps you’ve even glimpsed a blue Pegasus transforming in the big screen? What’s up with these colorful ponies in the periphery? Not to worry, you’ve just had a small taste of the bright and vibrant world of My Little Pony. My Little Pony is a popular franchise from Hasbro about talking ponies in the fantastic world of Equestria. Their merchandise is composed of collectible pony figurines that come with various accessories, notably their brushable hair. My Little Pony was also one of three classic Hasbro brands to receive an animated movie in the 1980’s, the other two being Transformers and G.I. Joe. The latest televised incarnation of My Little Pony is ‘Friendship is Magic’, about how one pony visits the town of Ponyville and the adventures that occur between her and her new friends. The stories range from exciting quests to slice of life but the clever writing and quality animation caught fire online and became an internet sensation that captured an audience beyond the targeted demographic. This sparked the creation of the Philippine Bronies, an organization of My Little Pony Friendship is Magic fans brought together by their mutual admiration of the franchise. The Bronies are a creative and talented set of artists, musicians, writers, designers, gamers and such who regularly meet up online or congregate in malls. 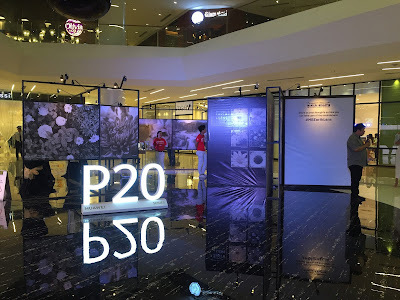 The group has had several conventions dedicated to MLP and will be celebrating their fifth convention on October 25, 2014 at Megamall’s Megatrade Conference Center on the 5th floor of Mega B from 11am to 8pm. The PHB Ponycon 2014 is not just for little kids or fans of the show. It’s also for those young at heart and parents looking to spend a fun day together with the family. Each hour starting from 12noon up to 6pm will highlight one particular pony of the ‘mane’ six characters of the show, starting with Twilight Sparkle’s trivia contest and ending with Rarity’s cosplay catwalk. There will be performances at the start of each hour, including several mascot appearances of Applejack, Pinkie Pie and Twilight Sparkle. A demo area is set aside for free play and a special maid café is ready to serve your culinary needs. There will be fun games for both children and of the older crowd and prizes will be had for all. The PHB Ponycon is free for children aged 10 years old and below. Regular tickets are P300. 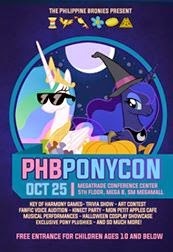 If you’re looking to party with the ponies this Halloween, be sure to drop by Megatrade Conference Center on the 5th floor of Mega B in Megamall this October 25, 2014 from 11am to 8pm. And don’t forget, Friendship is Magic!